Sen. Tom Barrett was elected to the Michigan Senate in November 2018 to represent the 24th District. Barrett serves as chair of the Transportation and Infrastructure Committee and as a member of the committees on Appropriations; Energy and Technology; Families, Seniors, and Veterans; Insurance and Banking; and Judiciary and Public Safety. As a member of the Senate Appropriations Committee, he serves as chair of the Justice and Public Safety subcommittee and as a member of the Community Health/Human Services subcommittee. Barrett served two terms as state representative for the 71st District, encompassing most of Eaton County. While in the House, Barrett chaired the Agriculture Committee and the Military and Veteran Affairs Committee and also served on the Energy Policy, Commerce, Government Operations, Communications and Technology, and Insurance committees. During his legislative tenure, Barrett sponsored over 30 bills that were signed into law with overwhelming bipartisan support. The bills tackled issues ranging from veteran affairs to education funding. After graduating public high school, Barrett joined the U.S. Army and has continued his service for nearly 20 years. He has served overseas in South Korea, Guantanamo Bay, Kuwait and Iraq and faced combat as a veteran of both Operation Enduring Freedom and Operation Iraqi Freedom. He is currently serving in the Michigan Army National Guard as a helicopter pilot trained on several different aircraft. Barrett has been awarded multiple Army Commendation medals, Army Achievement medals and other decorations. He holds the rank of Chief Warrant Officer 2. After returning home from Iraq, Barrett was hired as an analyst by the Michigan Department of Treasury. 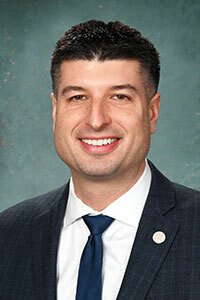 He served as the department’s Good Government liaison to the governor’s office and as the treasurer’s designee on the Michigan Land Bank board, focusing on areas of blight elimination and land re-utilization. Barrett is active in many community groups, including the National Rifle Association, Veterans of Foreign Wars, American Legion, Pheasants Forever, and Knights of Columbus. Barrett graduated from Western Michigan University with honors, earning a bachelor’s degree. Tom resides in Charlotte with his wife Ashley and their three children, Patrick, Eleanora and Gwendolyn. Senator Barrett can be contacted by clicking here.